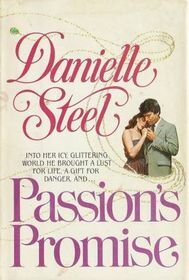 The book I chose for my 'popular author's first book' was Danielle Steel's Passion's Promise. As expected, it was a little faster read than the last book I read, and I was a little more engaged with the characters. If you're looking for a fun beach or summer read and haven't stumbled across this old classic, it was a fun read. This cracks me up, I used to steal my mom's Harlequins, mostly because I read everything I could get my hands on, but it probably explains why I am a hopeless romantic, lol. I've never read a Danielle Steel before. I know her books are very popular. I personally haven't read one, but people love them. My mom read those books when I was a kid. Haven't seen that author's name in a long time. I've read many of her books. That one looks like something I picked up in my 20's at the book exchange store! One great classic book to read for sure. Many will find this interesting. As for me, I have to know more info about the author.